The Value Of Cheerfulness: learning to " Take Joy"
learning to " Take Joy"
That springs triumphant in the furrowed sod. Not broken or divided, saith our God! Waits, at the threshold, Love’s appointed hour. That peep from out the brake, I stand confest. There doth My Godhead rest. Meekly I fit My stature to your need. Pass the low lintel of the human heart. This is the favorite poem of a very dear lady who you may already be familiar with. 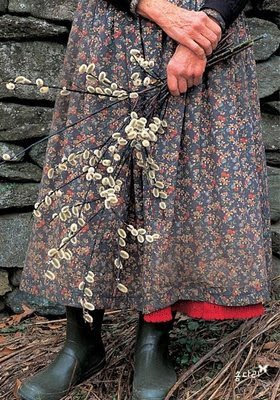 Tasha Tudor is her name. Her motto in life was " Take Joy, " isn't that lovely? I think I will borrow it from her. I have been reading about her life this week. 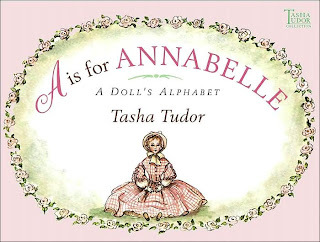 She wrote and illustrated several books, one in particular is very dear to our hearts about a favorite doll of her's, given to us by Grannie Annie called , A is for Annabelle. Which brings me to this interesting side note. 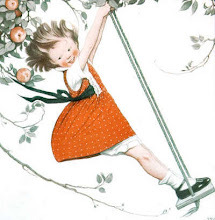 When Anniebelle saw a picture of this sweet little old lady she said, " look Mommy, she's kind of like Grannie Annie. " I find myself fasinated by the story and simple beauty of this woman's life and thought I would like to share her with you ladies, and that perhaps you might also find yourself blessed by her work and sweet spirit. So today I will continue to revel in our backyard black berry picking adventures and all of Annabelle's sweet pretendings. I will take mental pictures of her bouncing curly-topped head, making mud pies, dressed in a gauzy pink tu-tu, calling to me from the back porch..."Mommy you're the best girl I ever had. " Today I really don't see that it will be all that difficult to find reason after reason to "take joy," do you? How very sweet, and how very true. You are blessed, my friend, and you are a blessing. Love you much! oh Chelle... what a picture you paint. thank you for your oh so encouraging email this morning. Sweet! That is the correct word! I too adore this book. My grandma had given me one when I was five, and I remember it distinctly. I love you dearest of Chelles! you make "taking joy" so so easy - just by reading this post I feel more joyful!!! Happy weekend to you, sweet friend! With you around dear, it is never hard to "take joy." I love you dearest of dear friends! As soon as I saw the first picture I knew exactly who's dress that was. She has some really fun video's that you can get at the library called "Take Joy". It so fun to see her walking and talking in her home and garden in the video's. I love her stories for little ones. I was sorry when she passed away this June. But what wonderful books she leaves for us all. What a sweet sweet post and such a wonderful little passing, to remind us to take joy in the small and little things! It always brings JOY when reading a bit on your sweet life and oh how I adore hearing about your Anniebelle and her cute little conversations with you! You are such a joy my friend! A post just oozing with positivity! :) Loving your outlook on life.